From Faith Middleton: As we can see from a recent Planet Money story on NPR, millions of people are quitting their jobs each month, and Janet Yellen of The Fed thinks this is a good sign. She says if people are quitting in high numbers, that signals they're sure better jobs are available. In other words, a strong signal for the economy. What we also know is that the divorce rate is high, signaling that individuals are willing to move on from the normal stability of their lives in the hope of something better. Quitting can permit growth and learning, as well as the ability to frame new goals. Without the choice of giving up, most people will end up in a discouraging loop. 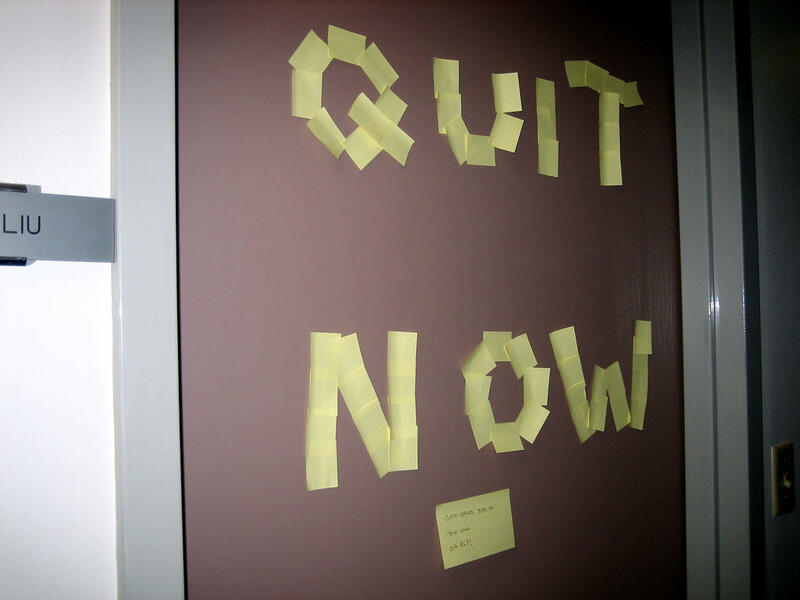 Quitting might be a healthy, adaptive response when an important goal can't be reached. Is there a danger zone? Oh, you bet there is. As New Haven psychologist Dr. Nancy Horn says, "Depression can come from feeling you have no choices in a given situation." And that means we must be careful that quitting is the wisest choice, not the go-to behavior simply because it feels good to restore any sense of choice. As my guests point out, and this is key, quitting is not an end; it's only the first step in redefining your goals and refocusing your life. For the person who feels like she's drowning in a given situation, think carefully before you leap. It's better for you, and it will keep you from thoughtlessly drowning others while you try to save yourself. It's also what responsible, healthy grownups do. Alan Bernstein is the co-author of Mastering the Art of Quitting: Why It Matters in Love, Life, and Work and served on the faculty at New York Medical College and New York University's doctoral program in psychology. Today: The way the thoughts we have and the decisions we make are influenced by forces that aren't always in our control. Today's show originally aired October 29, 2013. Afraid to fail? Eager to please? Chances are you'd like to become more brave. Discover why people from all walks of life found some nerve and immediately felt more alive.